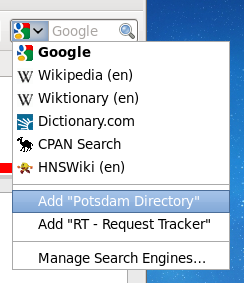 OpenSearch makes possible the handy little search widget in browsers these days. To view and add the plugins being offered from this page, simply open your OpenSearch dialog as below. A good resource on writing plugins: https://developer.mozilla.org/en/creating_opensearch_plugins_for_firefox.